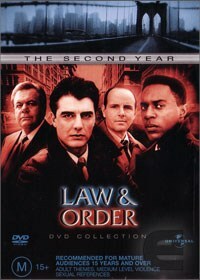 Back before it acquired “Special Victims’ Unit” and “Criminal Intent”, Law & Order was about NYC crims and the legal consequences of their crimes. I confess unfamiliarity with the genre, and that what used to most impress me about the show (during its promos or opening credits) was the big, impressive ampersand (&) in the title. I also embarrassedly admit my ignorance: I had no idea this show has been in non-stop production since 1990. This makes it almost exactly synchronous with The Simpsons—it is obvious which show I watched too much of and which almost none at all. But I figured I should do the genre justice and review this show. I found it very, very much exceeding my expectations. The cops are not all junkfood-munching morons who were the bullies in class. This show shows their daily frustrations with the system that ensures they have to be the good guys and do everything by the book or their whole project is rendered void. Close to my area of interest is the episode “God Bless the Child” (s2e5) about a religious sect and the parents who refuse their 5yo daughter medical treatment on religious grounds. In this particular episode, the first ‘half’ (that is, the criminal part) is over within five minutes (so the criminals are easily found). The more lengthy ‘half’ has to do with how the District Attorney (DA) will proceed with the prosecution of the parents—in other eps, the divide is different. The to-and-fro of bargaining and the ‘behind the legal scenes’ explorations are what made it interesting for me. The video transfer is okay, but not the best I have seen—the same goes for audio. But maybe this is because the episodes on it were produced in 1991 and I think the more recent seasons would have better audio-visual quality. This is a good show, but I daresay I can see why the branched out into “SVU” and “CI” later down the road… I mean, it could get repetitive and exhaustive after a while.